Since the release of Windows Vista, user interface of Network Connections in Windows has changed considerably from Windows XP, and to open up Network Connections folder to check and view all available LAN, Dial-up or High Speed Internet network access connections becomes a much more complicated task. Users have to click on Start button, then go to Control Panel, Network and Internet, Network and Sharing Center and then click on Manage Network Connections on the left Tasks pane to open Network Connections. With the following trick, we will create a quick access shortcut to immediately and instantly open Network Connections when clicked. 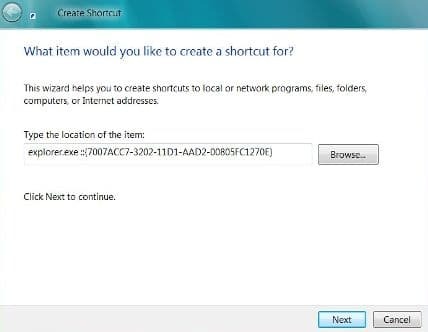 At empty area of Windows desktop or any other folder that you want to place the Network Connections shortcut, hit the right button of your mouse, i.e. right click on desktop area. Select New on the right click contextual menu, then click Shortcut. Click on Next button when done. Then you will be asked to type a name for this shortcut. 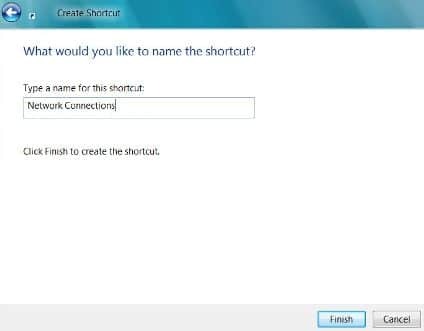 Enter a name to label the shortcut created, Network Connections is a reasonable choice. A shortcut will be created and placed on the desktop or folder that you initiated the new shortcut creation process. Now we can double click on this Network Connections shortcut to directly go into Network Connections folder without going through many clicks of navigation. If you prefer, you can also drag and drop the shortcut to Start Menu or Quick Launch bar. You can also right click on the shortcut and select “Pin to Start Menu” to have it shown in Start Menu. The trick works on most versions of Windows OS, including Windows 10, Windows 8.1, Windows 8, Windows 7 and Windows Vista.